Well the responses last night stirred up more. Below are two more that are representative of those that came in. I am just so surprised @ how surprised so many are @ what was portrayed in the original video - it was business as usual to me. I add a few comments in red below. It is almost beyond belief that Stark, as seen on the video, has no conception of what the Constitution stands for, or means to this country. Stark knows exactly what the Constitution means to the people of this country - that is how he has been elected 18 times in 37 years. Yet fools in CA vote this clown into office year after year. Because he delivers what they want. Pete must be similar to a sheep, following along with the crowd, having a thick coat to protect him from the opposition. No wonder Ca. is bankrupt. Look who is leading the flock, Pete & Nancy. Hopefully, not for long!!! I for one am not holding my breath that he will lose re-election. Thanks to our Midwest member for sending along the link for this video of an exchange between California Congressman Pete Stark & one of his constituents re what the federal government is not authorized to do if the Constitution is followed - which of course it is not every day of the week in our nation's capital. Stark has been elected 18 times in 37 years so the majority of his constituents approve of his positions. Surprisingly Stark is graded "D" by NTU with a 27% favorable rating - one of the highest of any Democrat. Being this favorable to taxpayers' interests in California makes me wonder how he got reelected so many times. Below is a report of the subject briefing that was sent out yesterday to several e-mail groups. Since this blog posting is a day behind those groups I also include five responses below that are representative of the type of interest that has been generated for the FairTax & FairTax supporting candidates that really started on the August 3 Candidates' Night event. Keep looking for the type of candidates we need to make a difference whether you live in NJ or elsewhere. In July I reached out to both Doug Herbert (Democrat) & Jim Gawron (Libertarian) to see if either or both would agree to a briefing on the FairTax - both are congressional candidates in District 11 running against incumbent Rodney Frelinghuysen (Republican) who has said he "is more against the FairTax now" than he was in October 2007 when Carol & I met him in his Washington office. 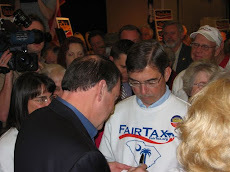 Mr. Gawron & I had an hour long minimum telephone conversation in late July @ which time he expressed favorable feelings toward the FairTax & said he would do his own study to determine if he would endorse the FairTax in the campaign. Mr. Gawron called me a few days ago & we set up a meeting for earlier today in which Sandy Sherman joined Carol & me for the briefing which was barely needed. Mr. Gawron has an excellent knowledge of economics & needed a brush up on only a few points on the FairTax @ the briefing. He will not need a training session to prepare for the attack ads & misleading debate points that are used by FairTax enemies. He has read The FairTax Book & many of the postings under "The FairTax" on ReturnToExcellence.net as well as the Candidates Night report. He will study the training session postings on the blog for both 2009 & 2010 which include the four points Bill Rollyson feels every candidate should know to fend off detractors' attacks as well as two I also encounter re paying the FairTax on a new house & black market dealings leading to a higher non-compliance rate under the FairTax. Prior to the briefing Mr. Gawron had already placed a link to FairTax.org on virtually every page of his website. Mr. Gawron is another candidate running in November on the FairTax against an incumbent (Frelinghuysen in his case) who will never support it. I am interested in learning more on the FairTax, in your opinion what is the best resource(s) that I can use to learn about it and recommend it to others. Also, will there be a seminar, or something more in depth for the FairTax that I can bring people to? Thank you Doug, for all the time and effort you keep putting into this. When will we see your name on the Ballot? I forward this to my family and friends and I have a category for my Grands for most of the political emails. They have to hear this from someone. Thanks for keeping us informed on the other district 11 candidates running in this years election. Do you think Mr. Gawron would consider attending our "New Bridgewater GOP Club" meeting in October? It is very refreshing to know I can vote for an alternative candidate other than a Democrat in November. Nothing would please me more then to put Gawron in the same room at the same time with the new Somerset County Republican Coordinator. Scott Sipprelle is running against Rush Holt in district 12. I looked at his website and saw he is for tax reform but for a flat tax not the FairTax. Have you talked to him? He seems like someone that maybe interested in supporting the fair tax if it was explained to him. I do not live in his district but my company is in his district. Thanks. Gawron will get my vote. Although I'll have to see it to believe it many pundits are convinced that the Democrats will lose enough seats in the November mid-term election to lose control of both the House & Senate. In preparing for this possible eventuality the House voted today 236 to 163 against a ban to hold lame duck sessions of Congress between November 3 & January 3, 2011. It has been widely circulated that if the Dems lose control of either the House or Senate that they plan to ram through as much of BO's agenda as possible in the lame duck session - Cap & Trade taxes, VAT in addition to income taxes, Union Card Check, & Amnesty for Illegals for openers - wonder if any one will notice as we get ready to celebrate the holidays? Today's House vote literally validates the Dems intention to pursue the lame duck fall back position if needed. As Charles Krauthammer recently wrote - "But assuming the elections go as currently projected, Obama's follow-on reforms are dead. Except for the fact that a lame-duck session, freezing in place the lopsided Democratic majorities of November 2008, would be populated by dozens of Democratic members who had lost reelection (in addition to those retiring). They could then vote for anything -- including measures they today shun as the midterms approach and their seats are threatened -- because they would have nothing to lose. They would be unemployed. And playing along with Obama might even brighten the prospects for, say, an ambassadorship to a sunny Caribbean isle." If you are going to play the game you have to know the rules & BO knows all the rules by heart - we have no match for him & we are outnumbered. In line with these thoughts thanks to our wonderful Midwest member who passed along this link to Dennis Prager's appearance @ the University of Denver where he so eloquently discussed America's biggest threat - & no it was not BO - it is even bigger & was already mentioned above. Carl Degler sums up @ least part of Mr. Prager's remarks when he writes - "The searing ordeal of the Great Depression purged the American people of their belief in the limited powers of the federal government & convinced them of the necessity of the guarantor state. And as the Civil War constituted a watershed in American thought, so the depression & its New Deal marked the crossing of a divide from which, it would seem, there could be no turning back." Last Thursday the trustees for Social Security & Medicare released their annual report indicating that Social Security will pay out more in benefits than it takes in both this year & next. Although Medicare's longer term theoretical solvency calculation improved those improvements were the result of promised cuts in payments to doctors & hospitals - the very people & institutions we rely on when we are sick & need medical treatment - how preposterous a premise for a calculation. Please refer to "Your Social Security Statement" that you receive every year from the federal government who counts on you not reading the front page which says that "at this point (when the fictitious, non-existent, & misnamed Social Security Trust Fund is theoretically exhausted), there will be enough money to pay only about 74 cents for each dollar of scheduled benefits." This means that the government is telling you that if you are collecting or counting on collecting $1000 per month your payment will be reduced to $740 per month (until the finances get even worse) once the Trust Fund is not able to be financed sufficiently by other government sources. Just look how scarce money is all over America right now - like in your household - & wonder where funds for a VAT addition to the income tax system or additional taxes to pay for Social Security benefits will come from in just a few short years. To put all of this into perspective please consider my letter below published in The Reporter on August 4, 2005. Not much has changed except doomsday for our entitlements is closer than 2018 as indicated in the trustees report projecting shortfalls in Social Security funding the next two years for starters. In Martin C. Stark’s letter to the editor in the June 16, 2005 Reporter he relies on the Social Security Trust Fund to fund any shortfalls between incoming FICA taxes & the outgoing beneficiary payments after 2018. We should understand that this trust fund is nothing more than a stack of IOUs that is not backed by real assets. There is no real money in the trust fund so that when 2018 comes & we call on the trust fund to support the actuarial shortfall we will have to sell the bonds (but to whom?) or print more money thereby causing inflation. The other choices are to raise taxes or lower benefits. Social Security cannot continue under the current system based on this information. The Social Security solvency problem can very easily and fairly be solved by replacing the wage index formula for calculating benefits with the CPI formula – see Susan Lee’s Wall Street Journal article dated November 23, 2004. Mr. Stark asks, “What type of social security insurance system do we want…?” My answer is that we want a system of me taking care of my retirement & him taking care of his. FDR created Social Security to help the elderly after the Great Depression because the elderly had no time to recoup their loses from that terrible economy. Finally, Mr. Stark is correct when he states “If it (personal accounts) runs out, its your problem” – and that is exactly as it should be. When people realize that they are responsible for themselves & will not be taken care of by some government program, they will work, save, & invest to make sure that they do not run out & they & the country will be much better off for their efforts. Social Security should be there only for the needy as FDR intended. The first ever "Candidates' Night" event took place last night - the purpose was to honor & thank a group of FairTax & tax reform grassroots people who ran for elective office in NJ during the past year. By all measures the event exceeded everyone's expectations & each of the speakers deserve all of the credit for their inspiring accounts of running for office. I am only so sorry for everyone who missed it. Carol thinks that every state should try to put on such an event - but first you have to spend the time & effort like we have in NJ developing a program to find such candidates. But it is a goal that each of you can try to make happen for your state & America. Below is a report that we are submitting to several newspapers along with the above photos. I also sent this information to Steve Moore of the WSJ who has asked me to keep him informed of our progress. An event billed as "Candidates' Night" was held on Tuesday night August 3, 2010 at the Bridgewater Library to honor and thank ten candidates for elective office in NJ who ran on the FairTax or tax reform within the last year. Three such candidates for U.S. Congress - Mike Agosta (District 9), Anna Little (District 6), & Tod Theise (District 5) all won their primaries and are on the ballot in November. Stan Serafin, former NJ Assembly candidate, was the keynote speaker to the standing room crowd which eventually spilled over to an adjoining room. Serafin's theme of having the courage to get involved was demonstrated by each of the ten candidates when they spoke individually to the group. They each explained why they ran and what they encountered as candidates. Each candidate was pure grassroots with little money and a desire to represent their constituents as someone who was of the people and not entrenched in the political party machines. All of the candidates spoke of the need for tax reform and were supportive of the FairTax. 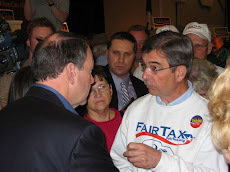 When elected Mike Agosta and Anna Little will become co-sponsors of HR 25, The FairTax Act. All current congressmen in NJ have not supported the FairTax. Specifically discussed were Frelinghuysen, Garrett, Lance, & Smith's opposition to the FairTax. Doug Hartlove, Volunteer State Director of FairTax NJ, asked everyone in the room to work one afternoon between now and the November election helping to spread the word of the FairTax support that each of the active candidates has shown. Such synergy could make the difference in propelling winning FairTax candidates.